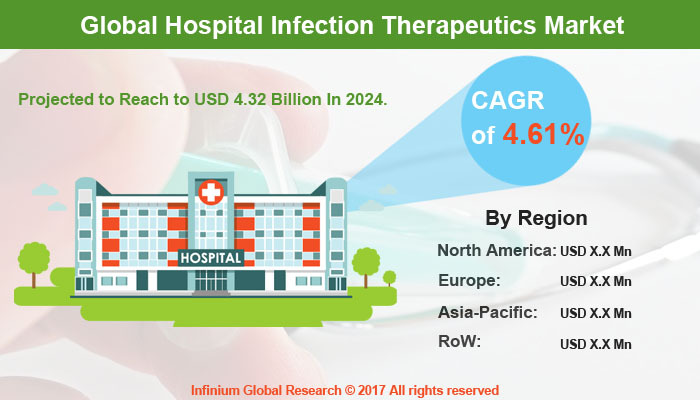 A recent report published by Infinium Global Research on hospital infection therapeutics market provides in depth analysis of segments and sub-segments in global as well as regional hospital infection therapeutics market. The study also highlights the impact of drivers, restraints and macro indicators on the global and regional hospital infection therapeutics market over the short term as well as long term. The report is a comprehensive presentation of trends, forecast and dollar values of global hospital infection therapeutics market. According to report the global hospital infection therapeutics market is projected to grow at a CAGR of 4.61% over the forecast period of 2018-2024. The global market size of hospital infection therapeutics market was worth around USD 3.13 billion and it is projected to reach to USD 4.32 billion in 2024. The growth of the hospital infection therapeutics market is primarily due to increase number of patients admitted to hospitals, growing prevalence of several hospital infections and High number of pipeline drug molecules for specific treatment of healthcare associated infections. Furthermore, lack of knowledge about the blood transfusion safety measures, understaffing, insufficient hospital equipment and poor infrastructure particularly seen in the developing and underdeveloped nations are some of factors responsible for spreading hospital infection which, in turn increases the hospital infection therapeutics market. However, increase number of surveillance and infection control programs by government agencies, hospitals and other medical institutes may restrain the growth of this market. Among the regions, the North America region accounted for the largest market share in 2017 followed by Europe. Major factors responsible for the leading position of the North American market includes rising number of multidrug- resistant microbial pathogens, increasing demand for advanced therapeutics and high prevalence of various hospital infections. Besides this rising geriatric population and high awareness level is contributing the growth of North American and European region respectively. Asia-Pacific is expected to grow at the highest CAGR on account of rising awareness, demand for new and improved hospital infection treatment drugs and increasing healthcare infrastructure are responsible for driving growth in this region over the forecast period. The report provides deep insights on demand forecasts, market trends and micro and macro indicators. In addition, this report provides insights on the factors that are driving and restraining the global hospital infection therapeutics market. Moreover, IGR-Growth Matrix analysis given in the report brings an insight on the investment areas that existing or new market players can consider. The report provides insights into the market using analytical tools such as Porter's five forces analysis and DRO analysis of hospital infection therapeutics market. Moreover, the study highlights current market trends and provides forecast from 2018-2024. We also have highlighted future trends in the hospital infection therapeutics market that will impact the demand during the forecast period. Moreover, the competitive analysis given in each regional market brings an insight on the market share of the leading players. This report will help manufacturers, suppliers and distributors of the hospital infection therapeutics market to understand the present and future trends in this market and formulate their strategies accordingly.